To meet a demanding manufacturing schedule of producing over 37,000 motorcycles a year, Triumph Motorcycles is committed to using the very latest production processes and techniques at its UK manufacturing base. 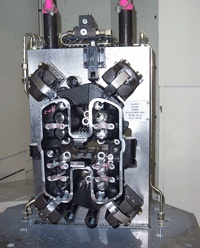 The company has invested heavily in hydraulic workholding over the years and recent investments include a new Heller twin pallet machine line, with Roemheld hydraulic clamps fitted as standard. 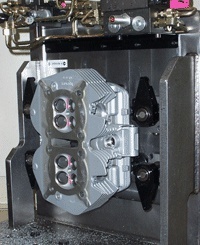 The Heller line, which features Roemheld Hydraulic swing clamps, block cylinders and work supports, produces cylinder heads and engine casings for the popular Rocket III model. The Rocket III, the largest capacity production motorcycle in the world, was created in 2004 for the US cruiser market but has since sold throughout the world. Despite its size, it is so balanced it can be ridden with the lightest of touches and has a 2294cc triple engine and torque of 147lb-ft at 2,500 rpm. The Roemheld hydraulic clamps allow for quick and repeatable clamping of the components, which is key to the line‘s average 15 minute cycle time. The operators need to load and unload in as short time as possible so single or two-handed start with air sensor clamping is the preferred method. The Roemheld clamps also allow the necessary control of tolerance as many of the parts are thin-walled and quite delicate. In some set-ups, the fixture plates will be attached to pallets and the pallets will then be moved as required for faster changeovers. Daily build plans drive production and the line can operate 24 hours a day, when sales demand. Production is based on individual models rather than batch work as this is found to be a more effective way of reducing the operators’ re-familiarisation. The Rocket III, like all of the motorcycles produced at the site, takes an average five and a half hours to manufacture. Triumph has been operating Lean principles for years, with the focus on multi-skilling and continuous improvement. An example of this was the decision to change to diamond pc tooling which allows up to 10,000 parts to be machined without change, rather than the 1,500 parts that could be machined using carbide tools. Similarly, the Roemheld hydraulic clamps are robust and reliable and require a lot less maintenance than more traditional clamping systems. The company’s move to Hinckley, following a fire at its previous works in 2002, meant that the entire manufacturing plant had to be set up again from scratch. The assembly line, which was devastated in the fire, was rebuilt on a larger scale in the new site with completely new equipment. The Hinckley site currently employs over a thousand employees and runs two engine lines, one chassis line and two machine shops, with a large design and development area. Some of the parts are made overseas at the Group’s factories in Thailand. The company produces an average of two new models a year, plus new model variations such as the Rocket III Classic. This investment in equipment and processes plus a massive commitment to research and development, certainly seems to be paying dividends for the Triumph Group. Despite the uncertain economic climate, Triumph motorcycles reported a 29% unit growth in 2005, thanks to the success of the new Speed Triple and Sprint ST models alongside the continued demand for existing favourites such as the Rocket III. 2006 also looks promising. Triumph has registered unit sales growth during the first four months of approximately 23% and the majority of the production volume for this financial year is already pre-sold.